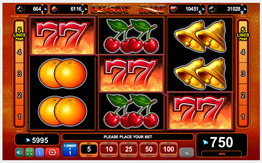 If you are looking for a simple uncomplicated slot game without Wilds and Scatters and Free Spins then Lucky Hot from Euro Games Technology will definitely appeal to you. The game comprises of 3 reels and 5 pay lines presenting the familiar fruit machine icons featuring oranges and lemons, plums and cherries. And these are interspersed with Bars, Bells, Stars and Sevens. The basic game rules apply – trigger at least 3 of them on an active line for a reward. Pay outs start with 3 Bells on a line yielding a multiplier x5 and three of any Fruit will pay x40.These rewards are quite generous and even more are the rewards for the Bar –x60 – Stars x200 however by far the best pay out are the 7’s giving you a fantastic multiplier of x750 of your stake. Euro Games Technology, as they have with most of their products, provide a Gamble feature. Players whose wins are less than x 35 their total bet are eligible to play the Gamble option and we have to stress it is an option. Guess the colour of the card that has been turned over and you double your win – guess wrong and you lose the lot. Players can play on the side the special Jackpot Cards game. Here there are 12 cards dealt face down and the challenge is to find 3 cards of a matching suit if you manage this have a look at the top of the screen to discover how much the progressive jackpot linked to the colour of the suit will pay. All these are Progressive Jackpots and rewards can be quite substantial. Jackpot Cards is made available on a random basis so if you are “Lucky Hot “you could be in for a nice pay out. As we have said Lucky Hot is a game in the traditional style – straightforward and simple which will please many players, but with a betting limit of 100, will probably not appeal to the more adventurous player!